SCE will provide free forklift loading onto buyer’s truck, we provide no rigging or tie down. Standridge 48” x 60” x 8” Granite Surface Plate w/ Rolling Base. Pyramid 36” x 48” x 6” 2-Ledge Granite Surface Plate w/ Rolling Base. Reco mdl. “BC SPECIAL” Demagnetizer w/ Cart. (15) Liebert “Precision Power” Power Distribution Modules 2002’s mdl. PPA150C Input 480V – 185Amp – 3 Phase – 60Hz Output 208/120V – 416Amp – 1&amp;3 Phase, 60Hz, 2007’s mdl. PPA125C Input 480V – 155Amp – 3 Phase – 60Hz Output 208/120V – 347Amp – 1&amp;3 Phase, 60Hz, 2005’s and 2004’s Input 480V – 124Amp – 3 Phase – 60Hz Output 208/120V – 278Amp – 1&amp;3 Phase, 60Hz. (6) Liebert “System-3” Air Handlers. (4) Liebert “CW Precision Cooling” Air Handlers. Trane. York, Lennox, Rheem, Carrier, Goodman and LG Industrial and Residential Air Conditioning Units. Hewlett Packard mdl. 8563E Spectrum Analyzer s/n 7286. Hewlett Packard mdl. 3580A Spectrum Analyzer s/n 1415A03478. Tektronix mdl. 2430A Oscilloscope s/n B012846. Hitachi mdl. V-650F Oscilloscope s/n 5070633. Hewlett Packard mdl. 6826A Bipolar Power Supply/Amplifier s/n 2315A-00899. Sorenson mdl. XTD-2030 DC Power Supply s/n 3718. BK Precision mdl. 1660 DC Power Supply s/n 16408544. Hipotronics mdl. KVM-100D Kilovolt Meter s/n 016214-00. Hewlett Packard mdl. 3465A Digital Multimeter s/n 1621A11560. Hewlett Packard mdl. 34401A Multimeter s/n 3146A0999. Fluke mdl. 45 Dual Display Multimeter s/n 5525140. Narda mdl. EMR-300 High Frequency Meter s/n BN2244/31. Hewlett Packard mdl. 4261A LCR Meter. Atlanta Laser Range Finder s/n 13665. Merticom mdl. 103947-000 Wangate Radio s/n SCE37-357. AH Systems mdl. SAS-550- 1B Active Monopole Antenna s/n 800. Wavetek mdl. 52A Data Logger s/n C93040182. Wavetek mdl. 166 Pulse/Function Generator s/n T6590379. Hewlett Packard mdl. 3325B Synthesizer / Function Generator s/n 2847A08263. Tektronix mdl. TM503 Function Generator s/n B126890. Heath Schlumberger mdl. SG-1275 Lin/Log Sweep Generator s/n 487. BK Precision mdl. 1822 Universal Counter s/n 103-00786. Yellow Springs Instruments mdl. 31 Conductivity Bridge s/n 5769. 7500 RPM, Programmable Coolant Nozzle, Rigid Tapping, Chip Auger, Coolant. 2010 Haas SHRT600 24” 4 th Axis Rotary Head s/n 600158 w/ 7 ½” “Big Bore” Thru Hole. 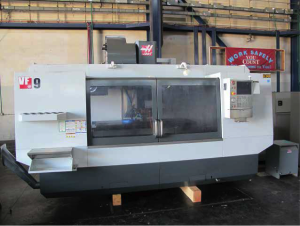 1992 Kuraki KBT-10DX 4-Axis CNC Horizontal Machining Center s/n 9641 w/ Fanuc Series 15-M Controls, 50-Taper Spindle, 40-Taper Adaptor, 4 th Axis Thru Table, 37 1/3” x 43 ½” Table, Hand Wheel, Chip Auger, Coolant. Hwacheon “Hollow Bore” 32” x 120” Geared Head Gap Bed Lathe w/ Heidenhain Programmable DRO, 6” Thru Spindle Bore, 15-1000 RPM, Inch/mm Threading, Tailstock, (2) Steady Rests, Follow Rest, KDK Tool Post, 25” 4-Jaw Chuck, 24” Face Plate. 2011 Hwacheon mdl. HL720 29” x 132” Geared Head Lathe s/n 261455 w/ Newall DP700 Programmable DRO, 27-1205 RPM, Inch Threading, Tailstock, (2) Steady Rests, 17 ½” 4-Jaw Secondary Tailstock Chuck with 10 ¼” Thru Bore, 15” 3-Jaw chuck, 15 ¾” 4-Jaw Chuck, Coolant. 2011 Hwacheon mdl. HL580 23” x 79” Geared Head Gap Bed Lathe s/n 256776 w/ 3” Thru Spindle Bore,28-1350 RPM, Inch Threading, Tailstock, Steady and Follow Rests, KDK Tool Post, 12” 3-Jaw Chuck, 14” 4-Jaw Chuck, 24” Faceplate, Coolant. IRD Mechanalysis mdl. B200F-40R High Precision Balancer s/n B46080 w/ IRD Series 290 Balance Controls, IRD mdl. 7600 Support Stands, 25,000 Lb Cap, 40Hp Motor, 18” Max Shaft Diameter, 150” Max Shaft Length. Hofmann / IRD mdl. HL-19.1 STAND High Precision Balancer s/n 80-4- 128 w/ Hofmann HM Microprocessor-Based Controls,IRD mdl. B50 Support Stands, 1000 Lb Cap. 6” Max Shaft Dia, 80” Max Shaft Length, 3603 Hours. Tree mdl. 2VGC Vertical Mill s/n 8737 w/ Colleted Spindle, Power Feeds, 10 ½” x 42” Table. DoAll mdl. 1612-1 16” Vertical Band Saw s/n 148-661042 w/ Blade Welder, 5200 Max Dial FPM, 24” x 24” Miter Table. Durango Associates “Flange Facer Series II” Hydraulic Flange Facing Unit s/n F-5805- 0193 w/ 4.74” to 34” Facing Cap.